The Casalfiumanese etymology of the name comes from the fusion of "Casal" (castle) and "Fiumanese" (river), given its proximity to Rio Salso. The origin of this town, according to tradition, dates back to the XI century and soon the town had assumed a name which largely follows the current one: Castram Casalis Flumanensis. In telling briefly the story of Casalfiumanese do not forget that Pope Honorius II, who ascended the throne of Peter in 1124 and ruled until 1230 was born in Fiagnano, a small hamlet of the town. Between 1126 and the 1130, Casalfiumanese was part of the feudal rule of the Bishop of Imola, following a bull of Honorius II. Borderland between Bologna and the Romagna, it has been the subject of ongoing disputes between Bologna and Imola. The latter took possession of the town in 1248 under the leadership of Cardinal Ottaviano Ubaldini, but forty-four years later the Alidosi family brought back Casalfiumanese under the control of Imola. In 1401 it became a fief of the Bentivoglio family until the time of Pope Julius II. Conquered in 1404 by Alberigo by Barbian, the town knew then to suffer ups and downs, like all the Romagna, until the restoration set by Julius III. With the Cisalpine Republic, Casalfiumanese was aggregated with Imola, and was later included in the province of Bologna in 1860. "(Cit. from" Atlas Romagnolo "- Il Resto del Carlino). The municipality has flourishing agriculture with one of the largest area in Italy dedicated to apricot. Large orchards, and quality vineyards, in the high hills overlooking the Valley of Sillaro, meadows and pastures with leading cattle and sheep for meat. 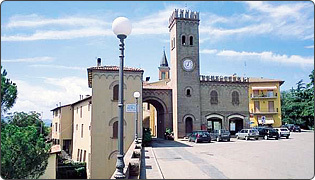 In Borgo Casale there is a big industrial area: there are companies such as ceramics, furniture and home furnishings, paper, construction, mechanical engineering and a popular craft. Sagra della Cuccagna: april (in Sassoleone). Parco in Festa e Sagra della Ficattola: last days of may and the first days in june. Sagra del Tortello: last days of june and the first days in july. Mostra e Sagra dell'Albicocca: last days of june. I Zug d'na volta - Festa del Latte: september.